Preparing for a career in a male-dominated field like tech is no easy feat for female students. But through a consistent and strong emphasis on supporting women in tech, Concordia professors hope to make a difference. They all answered yes, but only one, Concordia, could show actual proof. “[Concordia] didn’t just have to say yes, they showed me through the G.R.A.C.E. program,” Martens said. Chartered by the Women in Computing Council from the Association for Computing Machinery, G.R.A.C.E., an acronym for Girls Rocking Algorithms, Computing, and Electronics, is a student-led club designed to provide additional professional and personal development for female students as they pursue their education. Concordia is the first private university in the state of Wisconsin to launch a G.R.A.C.E. club on campus. 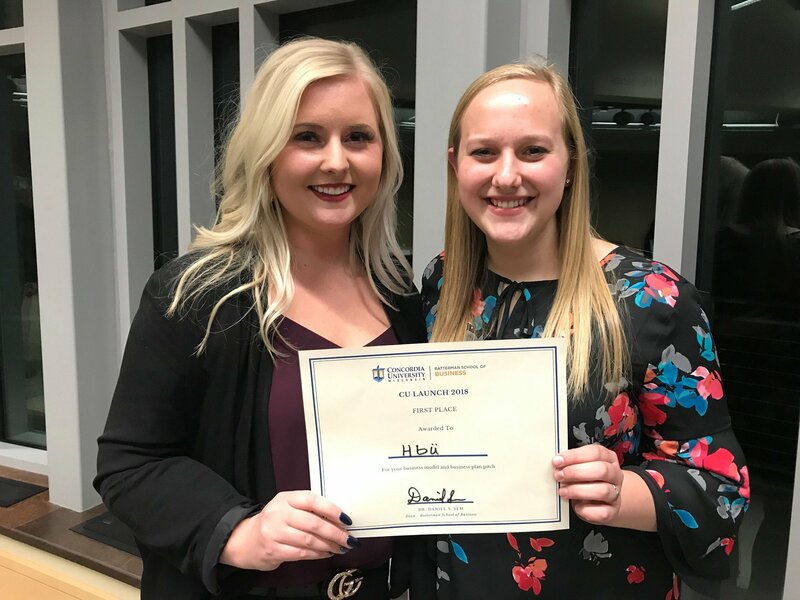 Students Grace Koester and Madie Martens take a celebratory photo after winning first place at CU Launch. And truly, they’re not. In fact, early history of computer science favors women with pioneers like Ada Lovelace and Grace Hopper heralding claims to fame in the history books. But somewhere in the years following their impact, the line of female leaders in the field began fading and thinning out. Their new app, HBU, is designed to bridge the gap between technology and mental health. As users record their moods, feelings, sleep schedule, and meals, the app analyzes the data to provide timely feedback to users on simple practices and habits that can improve their mental health. For example, HBU might recommend an afternoon walk for a user who frequently logs long naps in the afternoon. The idea for the app came to Koester during summer break when her own mental health struggle bubbled to the surface and finally spilled over. As Koester began owning the state of her mental health, her friends and family started opening up to her about their own personal struggles with mental health. With a brain for tech and a heart for wellness, Koester began brainstorming the solution—HBU. Back on campus for fall semester, CS faculty encouraged Koester and her peers to enter the CU Launch competition, providing the perfect gateway to materialize HBU. After teaming up with Martens, the two students not only entered the competition with HBU but took home first place in the undergraduate category with a winnings of $1,500. The quiet, yet steadfast confidence of the two girls is almost palpable as they recount their experience at Concordia and with the CS department. They plan to spend the spring semester, their last one at Concordia, building out the app, planning for its launch, and setting up dates to visit schools and tech conferences to spread the awareness of their new mental health tool. Their success points to the strong community of support and preparation that preceded them through their families, CS professors, G.R.A.C.E., and the Concordia community. It’s this kind of successful student outcome that drives Locklair and his colleagues forward in providing an exceptional learning experience for the many other students who will follow in the footsteps of Martens and Koester. Whether in undergraduate or graduate programs, the Concordia CS department shows no sign of slowing down in its championing of women in tech. Are you interested in pursuing a career in computer science or information technology? Want to be part of a learning community that values female contribution to the field? We have several different degrees available for both undergraduates and graduates. For computer science, check out our undergraduate computer science degree or our master’s degree in computer science. If you’d rather take the information technology route, check out our master of science in information technology program, offered online to give you full flexibility over your educational journey. For those who wish to take a business approach to the field, we have an MBA in Management Information Technology program that is also available online as well as at our local centers throughout Wisconsin. If this story has inspired you, why not explore how you can help further Concordia’s mission through giving. Concordia University Wisconsin is a Lutheran higher education community committed to helping students develop in mind, body, and spirit for service to Christ in the Church and in the world. The Computer Science department supports the mission of Concordia University Wisconsin by developing scientists and technologists who are effective problem solvers in the context of a Lutheran worldview.